For those who aren't familiar with Pho, it is a Vietnamese dish which consists of a broth topped with rice noodles, vegetables and/or meat. It is perfect for those chilly nights or rainy days. I could, however, pretty much eat this every day. It is so comforting... almost feels like a warm hug :). This is a vegetarian Pho recipe. I've used some of my favourite toppings but the choice is endless - you could add any vegetables you like. You could also make this with a meat broth and top it with some sautéed meat along with the vegetables. In a large pot, heat a tbsp of oil. Add the onion and fry till lightly brown. Add the ginger, star anise, cloves and fry for another minute. Pour in the vegetable stock, add the coriander stems and cover and cook on low heat for about 25 - 30 minutes. Cook the noodles as per the packet instructions and drain. Sauté the mushrooms and white part of the spring onions for 3-4 minutes. Lightly fry the tofu in oil. Prep the other toppings such as the chillies, ginger etc. Strain the stock and bring to a simmer for 2-3 minutes. Divide the noodles between the bowls. 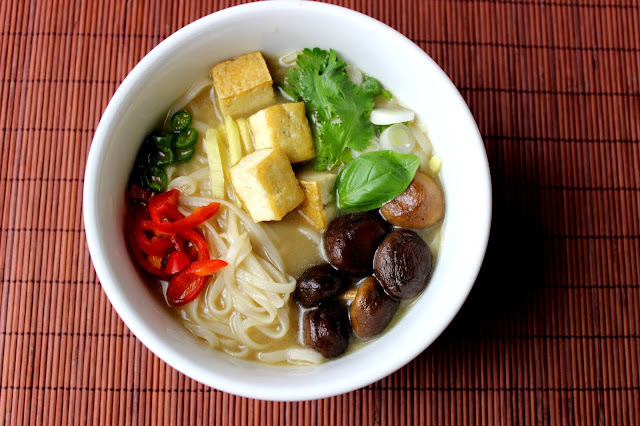 Pour the broth over the noodles and add the toppings - mushrooms, tofu, spring onions and garnish with the green part of the spring onions, chillies, coriander, basil and ginger matchsticks.